The pillars on County Road at the entrance to the Town of Minden once proudly bore a date of 1905. Perhaps it was wishful thinking; plans for this fresh town actually weren’t approved by County commissioners until 1906. And once it was a go, new homes began to spring up immediately in the fresh town. 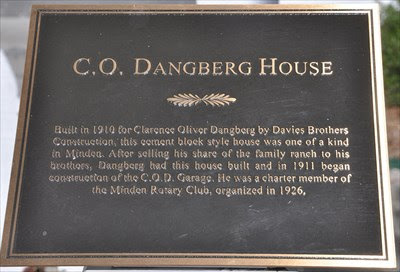 Minden was the brainchild of Henry Fred Dangberg, Jr., oldest son of H.F. Dangberg. After the death of H.F. Dangberg Sr. in 1904, Fred began to dream of creating a well-ordered, planned community — to be dubbed Minden, in honor of a town near his father’s birthplace in Germany. 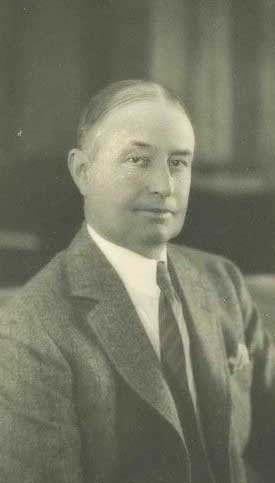 Town founder Henry F. Dangberg, Jr., sporting the snappy slicked-down hair, center part, and pocket handkerchief that were fashionable in his day. 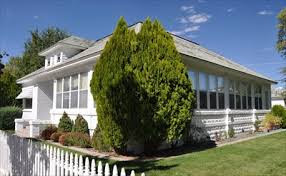 That means, of course, that many of the beautiful old homes and commercial establishments in Minden are now more than a century old. Luckily for historians and visitors, the Town of Minden has published a fabulous walking tour of its oldest buildings, featuring many of the gracious homes surrounding the town’s iconic square. Just click here to pull up their walking tour flyer. Scroll to the end for a handy map, which includes helpful thumbnail photos to help you identify the buildings. The C.O. Dangberg House at 1609 Esmeralda. Built by Davies Brothers Construction in 1910 for Clarence Oliver Dangberg, this house is made of thermally-efficient cement block, an innovative building material for the day. The C.O.D. 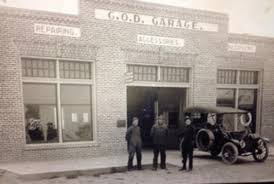 Garage, named for Clarence Oliver Dangberg. At the time this home was built, Clarence had sold his share of the family ranch to his brothers, and was about to turn his attention to his next creation, the C.O.D. Garage (just down the block, at 1593 Esmeralda), built in 1911. Clarence later became a founding charter member of the Minden Rotary Club in 1926. He died in 1938 and is buried at Lone Mountain cemetery. John Dangberg House, at 1600 Sixth St.
Another fascinating house on the walking tour map is the John Dangberg home. This beautiful two-story home was designed by noted Nevada architect F.J. DeLongchamps for H.F. Dangberg, Jr.’s younger brother, John. It was completed in 1912. John was president of H. F. Dangberg Land Livestock Company beginning in 1904. He also served as a director for Farmers’ Bank, Alpine Land Reservoir Company, East Fork Water Users Association, and Minden Milling Company. This home was later occupied by his daughter, Grace Dangberg, until her death. 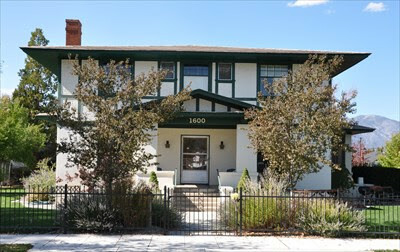 John Schrengohst house, 1578 Mono Avenue. This humble frame home with the twin-peaked roof was built by blacksmith John Schrengohst in 1918. John was born in Kansas in 1860. 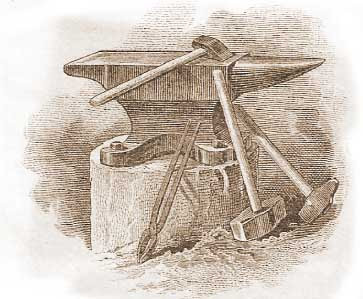 John and his son, Bill, were blacksmiths in Minden — an important trade in the days when horse-drawn buggies, wagons and farm tools were still in use. The Schrengohsts ran a family blacksmith shop across the street from this house for the next two decades. John died in 1938 at the age of 78, and is buried at Mottsville. Helpful plaques on many of the original Minden homes and businesses make it fun to visit the outside of these buildings in person. If you choose to make the tour in person, be sure to look for helpful brass plaques mounted at many homes and businesses in Minden’s historic downtown. We hope you’ll take time for a leisurely tour next time you visit this beautiful town! Enjoyed this story? We’d love it if you share on Facebook! Like to read more Sierra history stories like this, hot off the presses, as soon as they come out? Sign up for our free history newsletter at the top right of this page! It was June 15, 1893 on a remote stretch of road outside Jackson, California. Mike Tovey was again riding shotgun as security guard for Wells Fargo, this time aboard the stage headed from Ione into Jackson. Mike had been shot once before in his dangerous career; no doubt his eyes were always scanning the countryside for possible trouble. Over six feet tall, burly Wells Fargo guard Mike Tovey was known for his gentle humor and lack of fear. But as the stage crested Morrow Grade that fateful day, the vista was open — not the sort of territory where a concealed highwayman would be expected. And that’s exactly when a man clad in blue coveralls stepped out from behind a small clump of buckeye bushes — and, without warning, fired directly at the stage. Tovey toppled forward. A bullet had ripped its way through his heart. Fearless Mike Tovey, “one of the strongest, biggest and most cheerful shotgun messengers in the employ of the Wells Fargo Express company that ever rode through the lonely mountain passes of the Sierras,” was dead. Milton Sharp was a prison escapee. But was he Tovey’s killer? 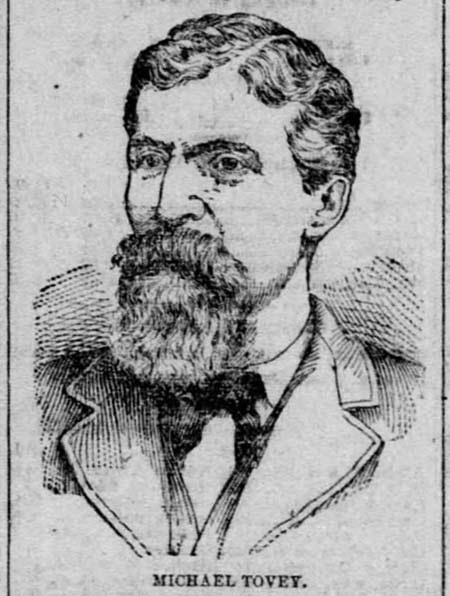 Suspicion promptly centered on Milton Sharp, of course — Tovey had been instrumental in sending Sharp to Nevada State Prison for a series of Bodie stage robberies in 1880. After several failed attempts to escape Sharp had finally successfully broken out of prison in 1889, and had been running from the law for four years before Tovey was shot. Rumor was that Sharp had sent threatening letters to Tovey — or at least someone had, using Sharp’s name. The hunt for Milton Sharp was on. He was soon captured in Red Bluff, California by a sharp-eyed police officer who recognized his “wanted” picture. But somehow the sweet-talking bandit managed to convince authorities he wasn’t the one responsible for Tovey’s killing. And although he still had a sentence to serve for his original stage robberies, Sharp had by now served nearly half his original twenty-year sentence. He managed to talk Wells Fargo into recommending a pardon for this earlier crime, claiming he’d become “rehabilitated” during his years on the run. 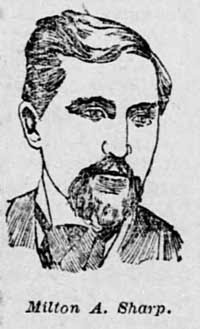 Sharp won a formal pardon in 1894 and was released. For the rest of his life he remained on the right side of the law — or so they say, anyway. So . . . Sharp wasn’t convicted of Tovey’s murder. Instead, a petty criminal named Bill Evans confessed to the crime. Well, he offered up a confession to it. Modern lawyers would cringe to hear that he did so without benefit of having a lawyer present. Evans would later say he’d been drugged and set up by an over-eager sheriff and a cooperating stool pigeon. So who shot Wells Fargo guard Mike Tovey? Even the press expected a “not guilty” verdict when Evans finally came to trial, due to the large volume of what the newspapermen carefully termed “conflicting evidence.” None other than Wells Fargo’s own detective was convinced that Evans was not guilty. It took two criminal trials. But three hours into deliberations following the second trial, a jury finally voted to convict. Evans was sentenced to spend the rest of his life in prison — for a murder he may or may not have committed. So did Evans really shoot Tovey? Or did Sharp, Tovey’s long-time enemy, not only exact revenge for sending him to prison but also get away with murder? And one other mystery: whatever happened to Milton Sharp’s robbery loot? Treasure-hunters are convinced that Sharp and his partner must have buried a good bit of their treasure. Estimates of how much was taken during the pair’s estimated 20 stage robberies vary. 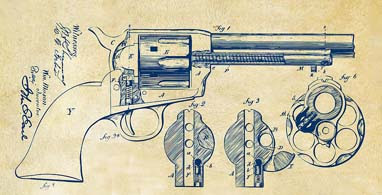 Some say it came to $6,000 (in 1880 dollars); others claim it could have been even more. Small portions of the loot were said to have been found in 1910 by a pair of treasure-hunting brothers named Hess. Wouldn’t we all love to know where the rest might still be hiding. P.S. We hope you’ll pay a visit to Mike Tovey’s grave if you’re ever at the Jackson City Cemetery. It’s close to Zacharius Kirkwood’s tall monument which has a ball on top. 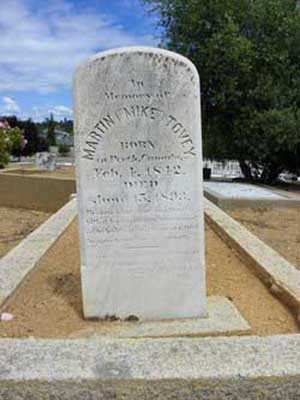 Mike Tovey’s grave at Jackson City Cemetery. Enjoyed this story? We’d love it if you leave us a comment below! And feel free to share on Facebook! (More) Best Sierra History Books! After our recent round-up of Sierra history books (you can find it here), we realized we’d left off a number of our own favorites — and we’ve also gotten some more great suggestions from readers! So check out this additional list for more fascinating Sierra history reads — and be sure to let us know if you have a favorite book to mention for next time! A Road from El Dorado, by Will Bagley (ed.). The real-life trail diary of former Mormon Battalion member Ephraim Green, this is the true, day-by-day account of the pioneering Mormons who blazed what soon became known as the Mormon-Emigrant Trail over the Sierras in 1848 as they made their way eastward from California back to Salt Lake. If you’re not familiar with Will Bagley, here’s the Wikipedia summary about him. Frontiersman Abner Blackburn’s Narrative, by Will Bagley (ed.) Another important work by noted historian Will Bagley, this is the story of Abner Blackburn, one of the original founders of Mormon Station in 1850 (the trading post which became Genoa). Blackburn’s adventurous life included multiple trips over the Sierra and discovering gold in Gold Canyon. William Brewer and a member of his survey party. Such a Landscape, by William Henry Brewer. We included Brewer’s familiar Up and Down California in our earlier list, and a reader urged us to include this title as well. Such a Landscape is the story of early survey expeditions through the Sierra, including the weather they encountered, equipment they brought, and how they mapped the landscape and measured peaks, back in the day. These “aggressively healthy” adventurers made impressive climbs, in impressive time. A coffee-table-style book filled with pictures, and a great companion to some of John Muir’s writings. For the fascinating backstory on Brewer himself (did you know he’d just lost his wife and son shortly before his 1860 exploring adventures began? ), here’s the Wikipedia thumbnail. The Humboldt, by Dale L. Morgan. Two extremely knowledgeable history friends both raved about this book, and Kirkus Reviews called it “colorful, adventurous, exciting reading.” Debuting in 1943 as part of a book series called “Rivers of America,” this volume’s reach extends far beyond the Humboldt itself to include the history of Carson Valley — an early and important historical work. The California Trail, by George R. Stewart. First published in 1964 in Great Britain, this engagingly-written narrative details America’s cross-continent migrations from 1841 through 1859, ending with a final chapter humorously titled “End of the Trail.” Great research is layered with unusual trail lore and beautifully-executed illustrations and maps. Among the line drawings are illustrations comparing three different styles of emigrant wagons, and detailing a trick for crossing a deep river with oxen. An excellent index at the back makes this a great find for history lovers and researchers. 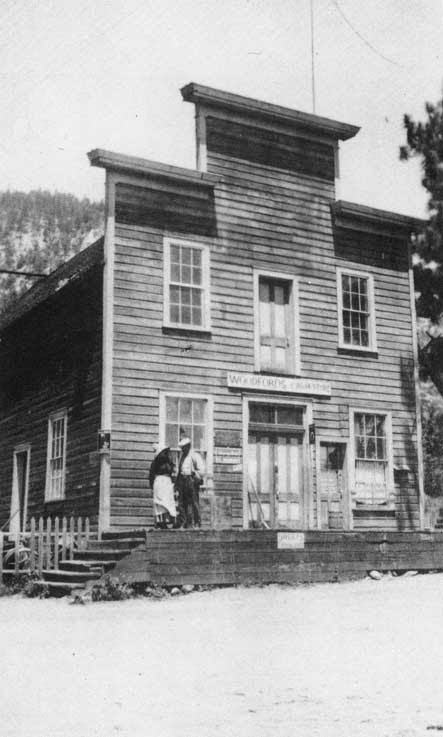 John A. Snowshoe Thompson: Pioneer Mail Carrier of the Sierra, by Frank Tortorich. The most recent release by one of our very favorite Sierra historians, the inimitable Frank Tortorich. This is the seminal work on the heroic “mailman of the Sierras,” John (Snowshoe) Thompson. A great read, and the most complete work we’ve seen on this legendary figure. As you may know, Frank has also written Gold Rush Trail: A Guide to the Carson River Route of the Emigrant Trail, a long-time favorite for enthusiasts eager to find — and walk — the Emigrant Trail for themselves. Hetch Hetchy and Its Dam Railroad, by Ted Wurm. A reader kindly suggested this well-illustrated book; it’s the fascinating story of the railway built by San Francisco to support the building of the O’Shaughnessy Dam (an improvement for the city’s water supply). In operation between 1917 to 1949 (when it finally was dismantled), this 68-mile railroad not only transported goods and supplies for the dam but also brought passengers out on sleeper-car excursions to view the construction, eat at the project bunkhouse, and enjoy the forest. Great photos make this an especially fun read. Hope you enjoy, and let us know your favorite Sierra read! Did stage robberies still occur as late as 1893? Just ask poor Mike Tovey; he died in one. The silent grave of Mike Tovey, in Jackson City Cemetery, who died in a stage robbery on June 15, 1893. This headstone was erected in his memory by his employer, Wells Fargo & Co. The headstone of Mike Tovey stands its silent vigil in the Jackson City Cemetery. It was erected by his employer, Wells Fargo & Co., which evidently felt a bit guilty about Tovey’s death. Victims reported two robbers worked the hold-ups in tandem. One robber, it was reported, was a true gentleman… well-dressed and unfailingly polite to the unfortunates riding the stage. The other robber — well, not so much. Victims described his voice as gruff and his manner as frightening. Handsome Wells Fargo guard “Mike” Tovey had wavy hair and a full beard. Born Feb 4, 1842 in Canada, his real first name was Martin. Wells Fargo assigned one of its best guards to the job: Mike Tovey. Tovey came well-equipped for stage protection. A giant of a man, he stood over six feet tall, was described simply as big, and had a reputation for being fearless. Sure enough, on September 5, 1880, while Tovey was on stage-protection duty, two men stepped out to hold up the Bodie and Carson Stage yet again, this time about seven miles from Aurora. Tobey managed to shoot one of the would-be robbers, taking a return bullet in the arm himself. 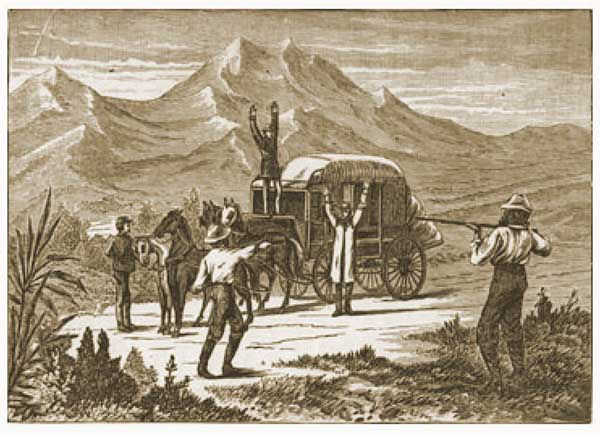 As Tovey was being whisked off to a nearby farmhouse to have his bullet wound attended to, a second Wells Fargo guard scoured the nearby sagebrush for traces of the remaining bandit. But even as pursuers were beating the bushes to look for him, “the robber doubled on his tracks, returned to the stage, and carried off the treasure box” — with its $700 inside. Talk about a cool customer! Wells Fargo, of course, was now more eager than ever to track down the villain — not to mention recover the money. Trained investigators were put on the task. These helpfully observed that the dead robber (the one Tovey had shot) had been wearing a peculiar “mask made of red morocco leather.” A clue worthy of a Sherlock Holmes himself! Unfortunately, the dead robber’s body got buried before investigators ever thought to check the dead man’s pockets… but when they did think of it, they belatedly had the body exhumed again. Sure enough, there in the dead robber’s pockets was important evidence: a bank passbook noting the man’s name, a recent deposit of $1,000, and an address at a Minna Street rooming house in San Francisco. The dead robber could now be officially identified as W.C. “Bill” Jones, aka Frank Dow. A felon who’d already served time at San Quentin, Jones (Dow) had been known for his heavy drinking, large beard, and scary-sounding voice. Aided by the helpful address, Wells Fargo’s investigator now had no difficulty tracking the dead man to his room in San Francisco. Detectives descended on the boarding house and the room was searched (apparently without bothering with the nicety of a search warrant). Lo and behold, a gold watch, ring, and other jewelry taken during the June stage robbery were found. Adding to the evidence: swatches of morocco leather turned up, similar to the dead robber’s mask. The man suspected of being the gentleman bandit who robbed the stage — and wounded Tovey — was a debonnaire character named Milton A. Sharp. 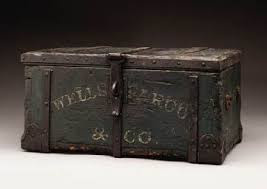 Jones’ fellow robber — the one who coolly made off with the cash box — was arrested at the same boarding house when he showed up a few hours later to “recover his valise.” Or at least, the authorities assumed it was the second robber. As soon as the valise-owner entered the house he was taken to the floor by deputies, a pair of pistols leveled at his head, and his belongings searched. His name, he told them, was Milton Anthony Sharp. Newspaper accounts made Sharp sound as if he had just stepped out of a novel: he was “remarkably fine-looking,” with “jet-black hair, swarthy complexion,” a goatee and black mustache, not to mention “eyes that shine so brightly that it is impossible to distinguish their color.” A few lady readers may have swooned. Sharp had the bad luck when arrested to be carrying an astronomical $2,400 in cash, along with other valuables. Naturally, he claimed he had come by it all honestly while working as a miner. But like his roommate, the dead robber, Sharp also had made a bank deposit on the very same day in the very same bank, and listed Minna Street as his address. Sharp was hauled off for trial at Aurora, where he was convicted of five counts of robbery, and sent to cool his heels in State Prison for twenty years. There the gentleman bandit was described by his fellow prisoners as the “chief aristocrat in their midst,” or at least so the Pioche Record proclaimed in December, 1880. But Sharp had a few tricks up his sleeve: he managed to escape incarceration not once but twice! While awaiting trial he tunneled his way out of the Aurora jail, taking off with a 15-pound ball-and-chain still attached, later found smashed against a rock. Sharp was quickly recaptured and sent off to state prison, but nine years later, managed to escape there, too. Four years after his second escape, Sharp was still running from the law when someone shot Wells Fargo guard Mike Tovey for a second time, as he guarded the stage headed for Jackson. This time, the wound to Tovey proved instantly fatal. Was the murderer Sharp? Tune in for the rest of the story in Part 2! Enjoyed this story? We’d love it if you leave us a comment below! And feel free to share on Facebook. If you’ve ever stopped at Woodfords, you may have seen the Wade House — and probably never gave it a second glance. 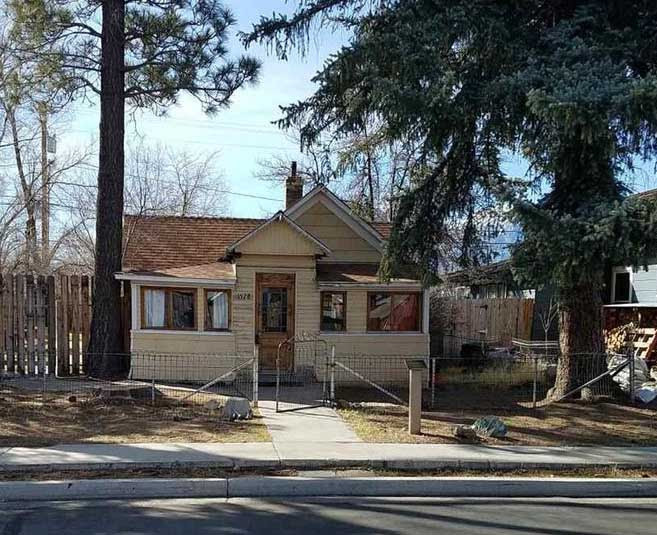 But this small, nondescript green house has an amazing claim to fame: it’s said to be the oldest continuously-inhabited dwelling on the entire Eastern Sierra! The original cabin (likely just a single room) was built by mill-builder Thomas Knott when he arrived in 1853. 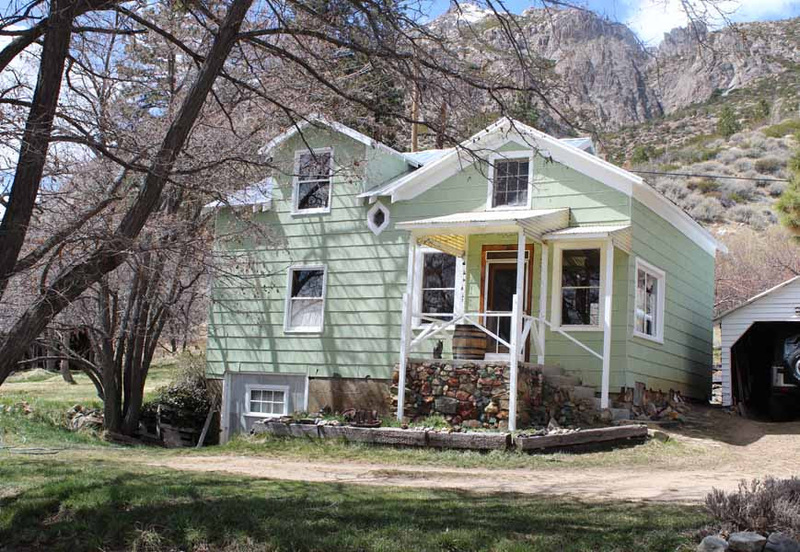 The cabin was sold that same year to John Cary, when Knott moved to Mormon Station to build yet another mill (one for which he would never get paid!) Some of the boards in the Wade House are said to be 18 and 24 inches in width, and probably were the product of Knott’s early sawmill. 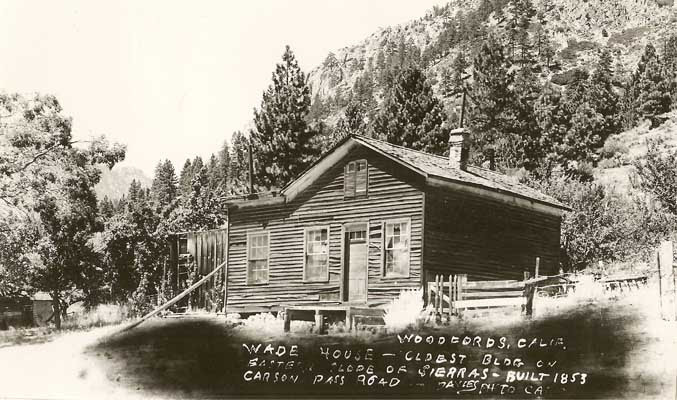 Another early view of the old Wade house (circa 1920s). This view is probably slightly more recent than the first photo, above; the same fence and gate are still present on the right, but in much worse condition. The large addition on the left is gone. Long before white settlers ever arrived, of course, the area around what is Woodfords today was a popular gathering spot and campsite for local Washo. Some of their descendants still live nearby. The trail up Carson Canyon (today’s Highway 88) is said to have been a major Native American trading route, used by Native Americans for centuries as they traded obsidian and pine nuts for acorn and other goods on the other side of the Sierra. Cary sold the cabin to William Wade and his wife, Clarissa in the early 1860s. 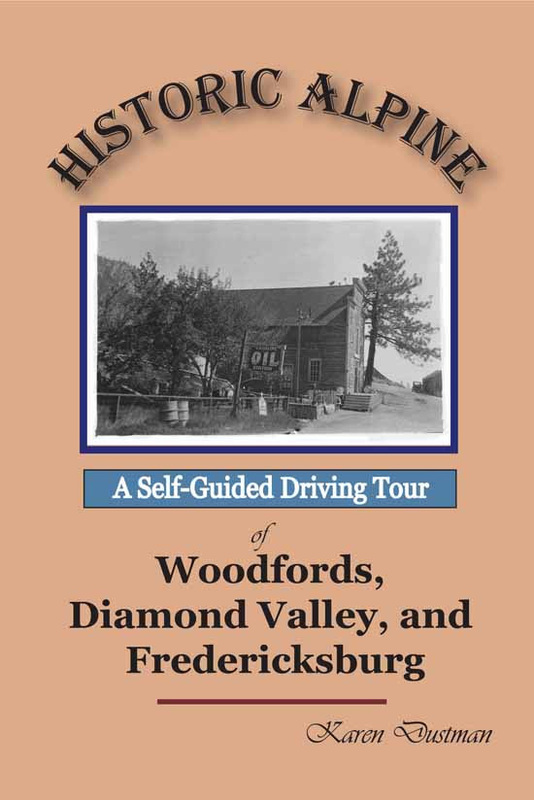 The Wades had crossed the plains in 1853 by wagon and settled initially near Fredericksburg. They moved here to Woodfords in 1858, where William was employed as a mill-hand at Cary’s lumber mill. He would later serve as the town’s postmaster and the local justice of the peace. Orville Wade likely operated his store in this building, sometimes called Nye’s Hall (after its original builder). This two-story building stood at the same spot as today’s Woodfords Station/Mad Dog Cafe. William’s younger brother, Orville, later came west as well with his wife and children. Orville ran a store and operated a small hotel here at Woodfords. Could the large addition to the Wade House have been added for them? We’ll probably never know for sure, but take a look at the left-hand section of building in top photo, above. After nearly twenty happy years here at Woodfords, William Wade died in 1877 — the result of a terrible mistake. His son, James, had erysipelas, a bacterial infection of the skin. William came home one day with an open cut on his own wrist and, seeing James’ medicine bottle, dabbed a bit of the remedy on the wound, using a feather which his son had also used as an applicator. Within a few days the mistake became obvious: the infection spread through William’s body. Both his arms swelled up terribly and “mortification” (gangrene) set in. Concerned neighbors brought William to Genoa Hot Springs for treatment, but the doctor there pronounced it too late. The horrible swelling continued to spread, finally reaching William’s mouth and throat, and he died there at Walley’s from asphyxiation. William’s brother Orville left Woodfords the following year for Oregon. Clarissa, now a widow, continued to live alone in the old Wade house, taking in boarders to help make ends meet. She passed away there in her home in January, 1890, one of the most severe winters on record. There was no way to bury her in the frozen earth, so townsfolk planted her body temporarily in a snowdrift until the spring thaw set in, when a proper grave could be prepared. More fun local history (check out our book page)! Clarissa — and most likely her husband, William, too — now rest in peace in the old graveyard just up the road from the old Wade House where they lived so long. Enjoyed this story? We’d love it if you leave us a comment below!